"This whole chunk of land will be decimated…!" 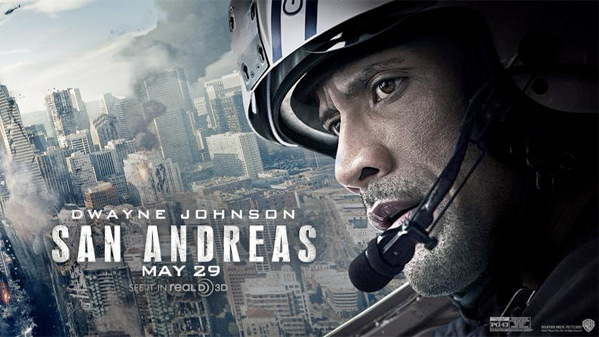 Warner Bros has debuted a third trailer for San Andreas, the big earthquake movie starring Dwayne Johnson they've been building up for a summer release. We've already seen two good trailers for this already, teasing some of the epic destruction and mayhem including a huge tsunami wave and pretty much all of Los Angeles collapsing upon itself. This definitely does look like a Roland Emmerich movie (even a spiritual sequel to 2012) but without some of the Emmerich quirks, for better or worse. Honestly, I'm curious to see this, something about the emotional angle that gets me. Enjoy! Watch the first teaser trailer for San Andreas here, and follow-up with the second trailer here after this one. wait.. what ? what 2 good trailers ? This is a great HBO Tuesday morning kind of movie. 2 booby wobble runs in one trailer! Always enjoy a good disaster flick and a Rock flick. So good. If good means awesomely bad. In the tradition of TWISTER, VOLCANO, and THE DAY AFTER TOMORROW. I'm actually really looking forward to this movie outside of the fact that I really enjoy natural disaster movies. And I think this movie hits more at home when you're living in California, like myself. Yes this quake would impact the entire country, but it's a bigger deal to us Californians who know we're living on a ticking timebomb. Last trailer somehow seemed more epic and tension filled... this all felt somehow very dull by comparison. Music was probably the problem at least partly. Just when you think The Rock has finally gotten past silly roles he goes back to crap like this.